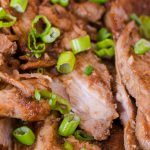 What’s there to say about this easy, yet ever-so-flavorful pork tenderloin recipe, other than it’s easy and ever-so-flavorful. I knew I was going to have a busy day ahead of myself so I tossed this into the slow-cooker and went about my day. I can usually find these on sale at the grocery store for buy one get one free, which make this recipe pretty useful. I served the pork with quinoa cooked in my rice cooker with chicken broth (rather than water), and a little soy drizzled over it at the table. My kids were happy and the old man was happy, which made me happy. The pork was so tender that even my 14-month-old was able to eat it. I spent five minutes prepping the pork for the slow cooker and went about my day. It was ready in time for dinner. If you find the pork tenderloin on sale you can feed an army cheaper than if you took your family to a cheap fast food restaurant. Check out these other carnivorous recipes. Just mix a couple ingredients in a bowl, plop the pork into your slow cooker, pour contents of the bowl over the pork, then step away. In a small bowl combine the chicken broth, balsamic vinegar, sesame oil, soy sauce, garlic powder, ground ginger, and black pepper. Stir until blended. Add the pork loins to the slow cooker and pour the soy mixture on top. Replace lid and turn the slow cooker down to low heat. For very tender pork loin, allow cooking for 6 hours (or less for a firmer texture). Optional - About 15 minutes prior to serving, using a ladle, remove as much of the liquid from the slow cooker as you can and place in a pot. Optional - On high heat, allow the liquid to reduce in the pot until dark brown and slightly thicker. Remove the pork from the slow cooker and slice. Place in a large bowl. Optional - Drizzle the reduced liquid onto the pork.